much deeper insight into ‘how birds are put together’. 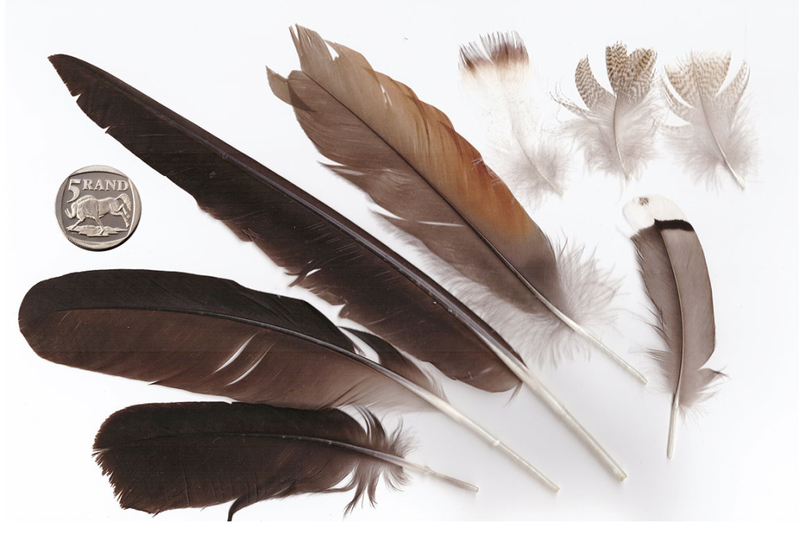 One of the first steps is learning to recognise the different feather types e.g. 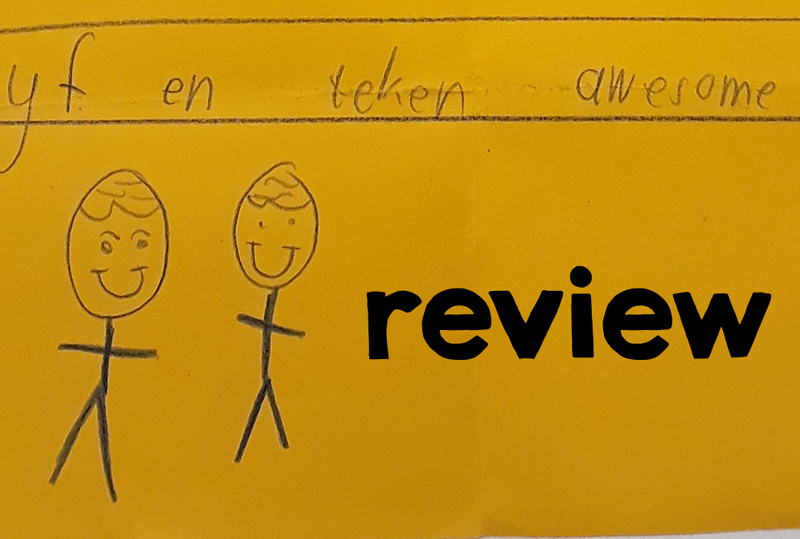 distinguishing primaries and secondaries, rectrices and remiges, and so on. The next step is working out to which species those feathers belong – a challenging but fun endeavor. So, I scratched around at home and scanned some feathers. I included a R5 coin (26 mm) to give an indication of scale . I’ve ranked the 12 questions from easy to hard. Each question is accompanied by two flip boxes – one with a clue, and one with the answer and explanation. BE CAREFUL NOT TO ACCIDENTALLY REVEAL THE ANSWERS! 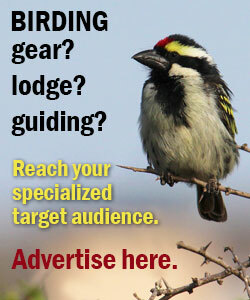 If you’re an experienced birder, I would skip the clue – don’t want to make things too easy now, do we? Good luck! One morning I picked up a whole bunch of feathers of this species in a small area – I wonder whether a cat may have caught the owner during the night. 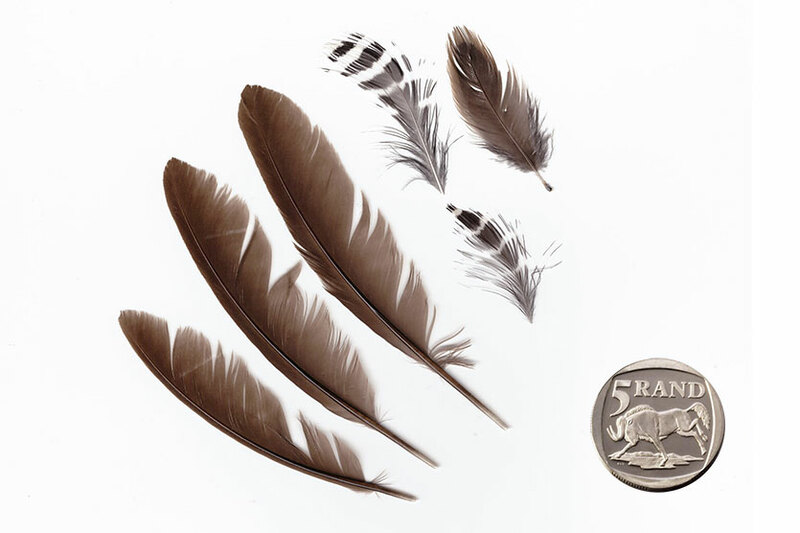 Of the 5 small feathers, the top one is a flank feather, the next two are wing coverts, and the last two are scapulars. 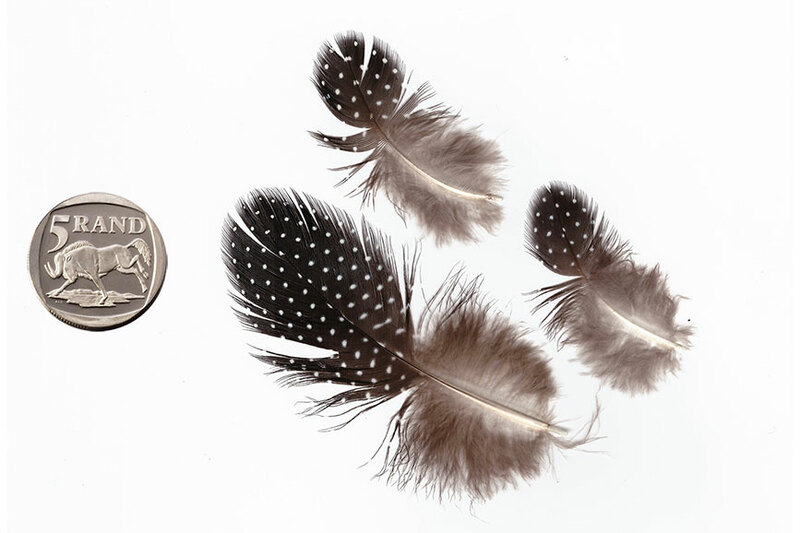 The large black feather is a middle primary from the left wing, and the large greyish one is a tertial from the right wing. 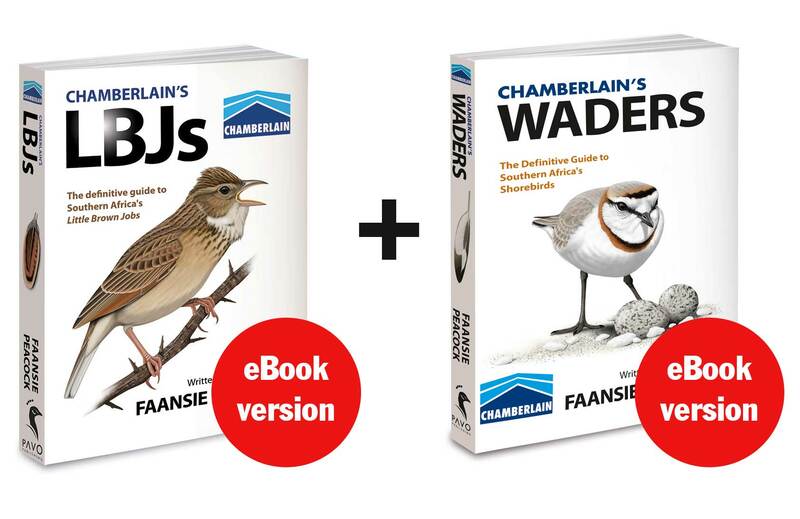 A nocturnal, terrestrial wader…with a loud voice. Often seen on lawns, or in car headlights at night. The small white tip and white base on the primary are clues (the latter forms the white inner wing patch visible in flight). The other feathers have a distinct tawny colour. Look for the heart-shaped marking at the tip of the wing coverts. I picked up this feather about 50 m in from the banks of the Chobe River. I was craning my neck to see the owner, but to no avail. This is obviously quite a large feather. The colour and markings provide further clues. The fairly symmetrical inner and outer webs suggest that it might be a secondary or inner primary, from the right wing. When you shake this feather it makes a swooshing sound, quite unlike feathers of its close relatives. Wonder what the reason for that could be? There are few such large birds with this distinctive tawny ‘teddy-bear’ colour, which in combination with the coarse barring should have given you the right answer. More often than not, fish bones, pellets and the odd such feather are the only clues to the presence of a Pel’s. The clue references the fact that owls have a special frayed margin to their feathers, which make them silky soft to the touch. Consequently owls can fly silently when hunting, to surprise prey. As a fish-eater, Pel’s Fishing Owl does not need this adaptation and its feathers make a noise when air flows over them. As these birds use traditional roost sites – sometimes for years – their feathers are easy to find if you know where to look. A pair of these birds roost around a water reservoir in an open plot in suburbia. I am often surprised that there is still sufficient food for them in towns and cities. The feathers have a particularly soft and silky texture – this reduced the sound they make so the birds can swoop down on unsuspecting prey (which includes more than 60 species, ranging from snails to hares). 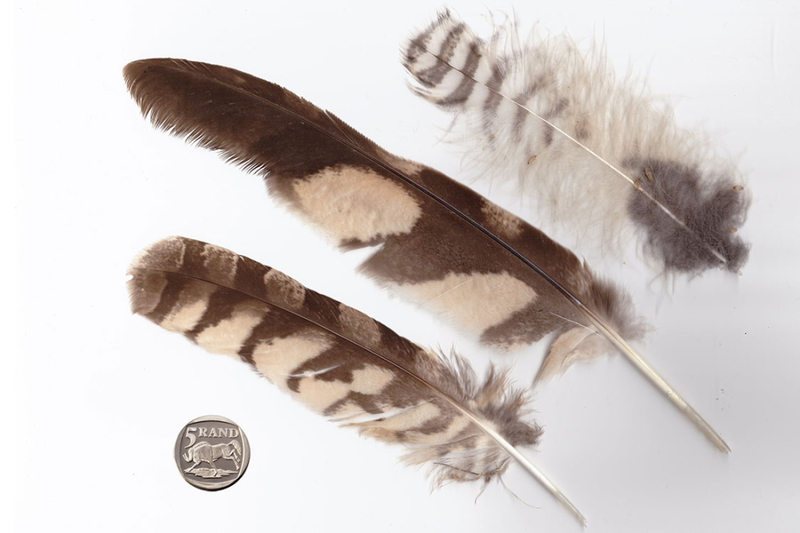 Owl flight feathers have a remarkable soft texture, and in particular, an additional line of fine barbules on the leading edge of the remiges. 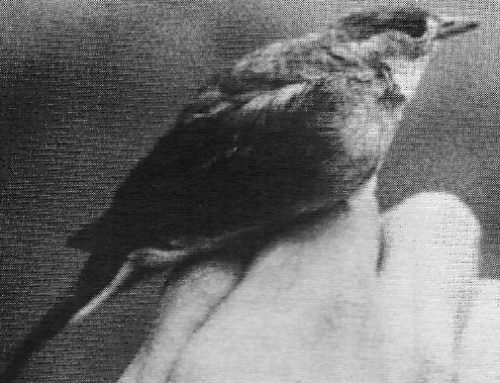 You can see even see it in this picture if you look at the middle feather (the primary): on the narrower leading edge, just distal to the kink, the edge of the feather seems to be pixelated – those are the barbules! 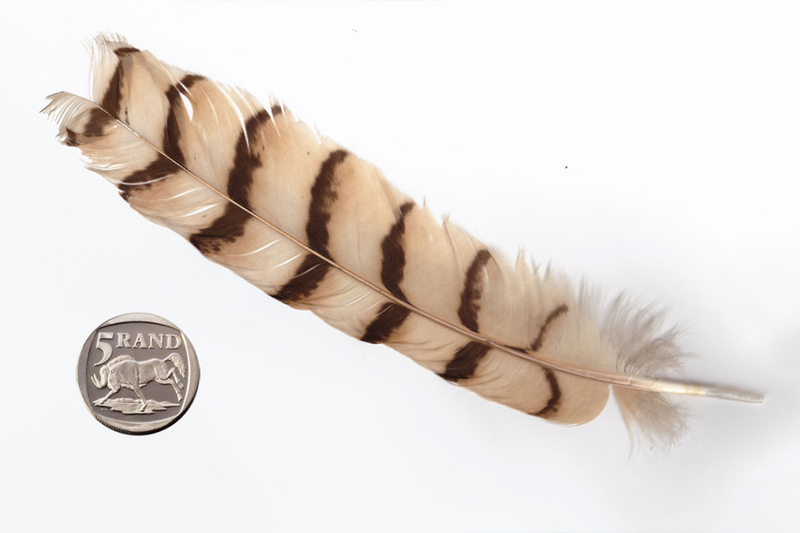 To be fair, you would be hard-pressed to tell Spotted and Cape Eagle Owl feathers apart. However, the fine barring is more indicative of Spotted. Also, Cape Eagle Owl rarely enter towns and cities – even in rural areas. The owl on your neighbour’s roof is a Spottie, and not a Cape. I promise. I found a dead individual simply lying next to one of the sewerage ponds. It had no visible external injuries, and did not appear emaciated. I am not sure what the cause of death was, but it did give me the opportunity to have a close look at its gorgeous plumage – in this case, two tertials and two adjacent secondaries. The tertial feathers are pretty much plain dark brown, except that they have a neat white fringe all the way around. 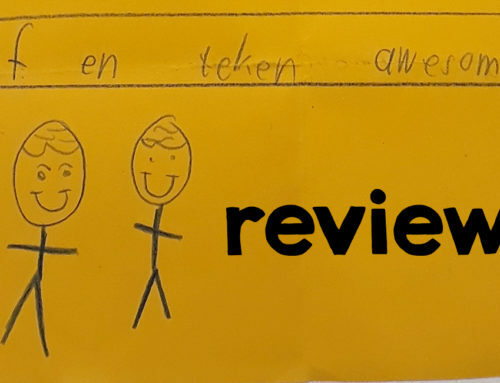 Their pointed shape is also typical of this family. The secondaries are much more striking however, and together their iridescent blue-green surfaces form a beautiful contrasting panel, called a speculum, that is revealed when the bird flies. The mention of a speculum in the clue may have alerted you that this is a duck. But which species? Careful examination of the secondaries show that they have glossy central parts, a black subterminal band, and a white tip. This pattern is only present in 4 local duck species: Yellow-billed, African Black, Mallard and Northern Pintail. The latter is easily excluded as (apart from being a very rare vagrant), its tertials and scapulars are lanceolate, grey-white-and-black structures. The colour of the speculum can change deceivingly in different angles of light, but is typically blue in Mallard, and purple in African Black Duck. This leaves us with Yellowbill! A covey of these peculiar birds came strutting past me on a walk in the Soutpansberg. They paused for a few moments to preen and scratch in the dirt, and left these gorgeous feathers as the only evidence of our brief meeting. There are only a few birds in the world with such black feathers with small white spots. 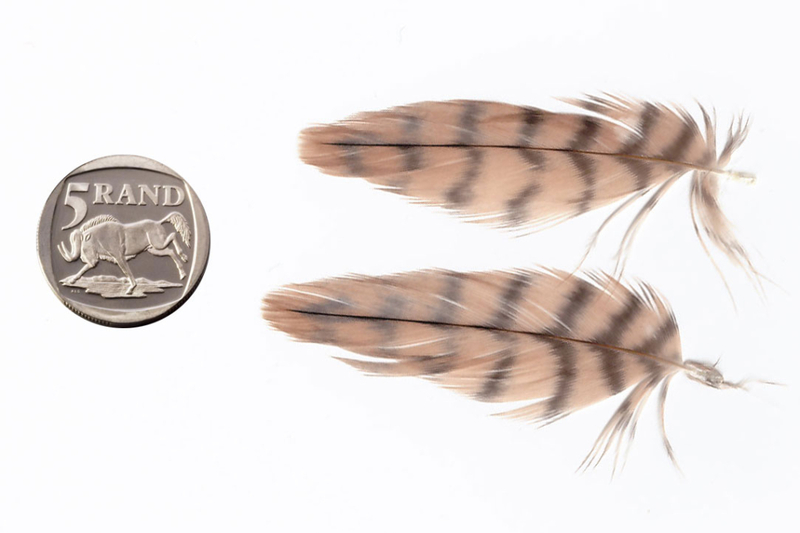 In fact, these spotted feathers are characteristic of a bird family found only in Africa. 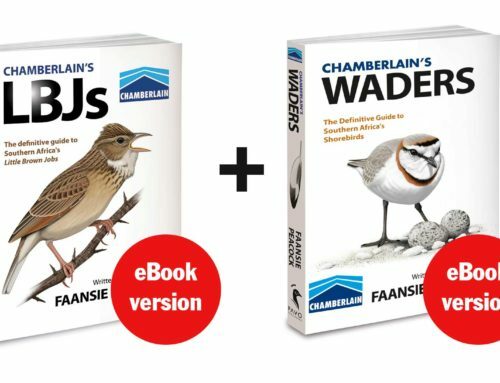 Two species occur in South Africa – can you figure out which one this is? 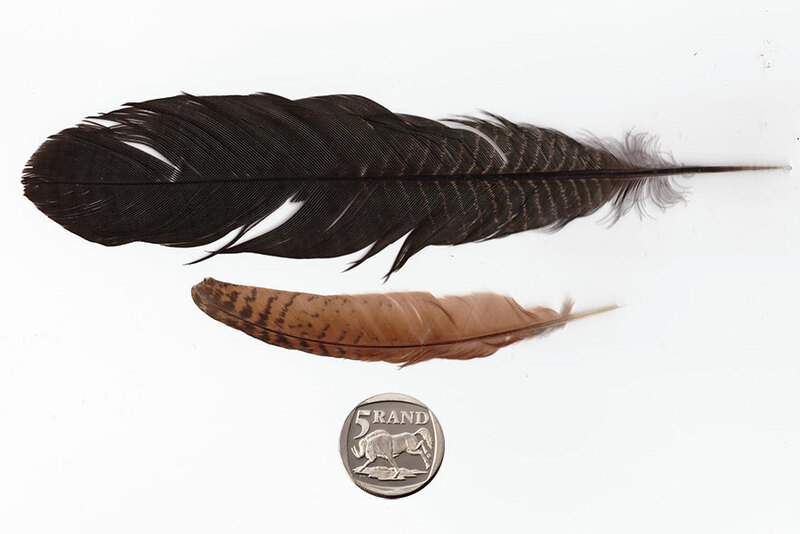 Most people would have guessed that these are guineafowl feathers, but do they belong to the common and widespread Helmeted Guineafowl, or the much more restricted subtropical Crested Guineafowl. In the latter, the feathers are more solidly black, infused with a distinct blue gloss, with many small and regular, round ‘pinprick’ spots. In Helmeted, the spots are larger and irregular in shape, and the feather background is faintly mottled grey. Unlike in Helmeted, Crested Guineafowl flight feathers also have a row of spots on the outer edge (forming a line on the folded wing). Finally, the inner secondaries of Crested are, unexpectedly, plain cream in colour. Many of these large birds were loafing on a bank overlooking a pungent pond, occasionally probing halfheartedly in soft mud, stretching a wing, or having a scratch. I found a few clean feathers in between their droppings. 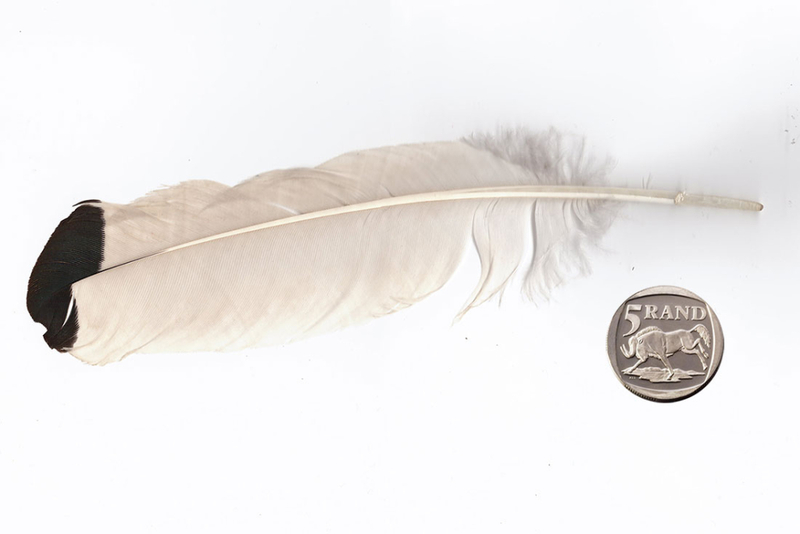 Judging by the size of the coin this is obviously quite a large bird. The habitat and habits provide further clues. This feather is an outer secondary (i.e. would sit more or less in the middle of the wing). There are many birds with white, black-tipepd flight feathers including raptors, albatrosses, pelicans and storks but none of these really fit the description of the location and behaviour (sewerage pond, in a group, probing with bill etc.). In fact, Sacred Ibises are really the only large freshwater species in which the white flight feathers have such a restricted black tip – this forms a narrow black trailing edge on the wing. Note however, that juvenile African Spoonbills also show black on their primary tips! This bird can be rather secretive, but at times perches conspicuously on low vantage points. It is rather slow and clumsy (foraging primarily by walking around on the ground or climbing in low tangled vegetation), and can easily be struck by cars when they scuttle across the tracks. That is exactly what happened to this poor fellow. Fortunately it survived the encounter, sans a few feathers. These two feathers look quite different, and could even assume they’re from different species. The larger one is a tail feather, and the shorter rusty one is a secondary. 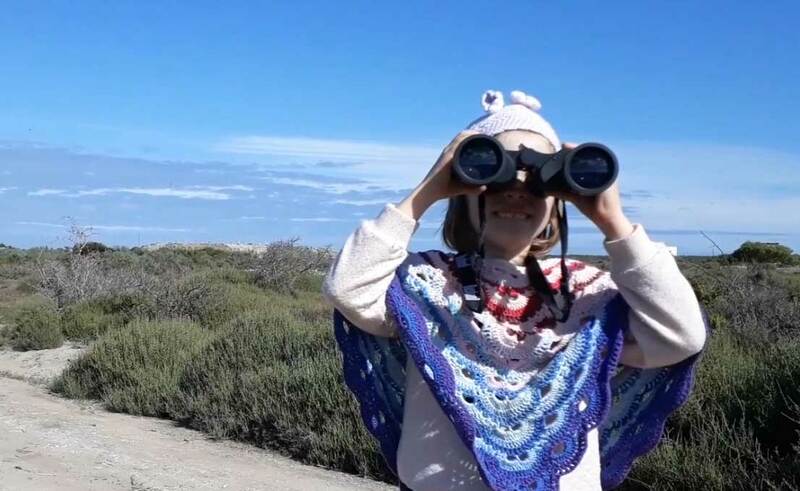 Interesting to note that the flight feathers are so short and curved – so we’re looking for a bird with a long, heavy tail longer but a short, rounded wing. A weak flyer. The fine barring on the base of the tail (and uppertail coverts) is characteristic of Burchell’s Coucal and separates it from e.g. Senegal Coucal.The wing feathers are distinctly curved, and rusty in colour. In younger birds, such as this one, the wing feathers can show fine transverse barring. A hundred or so of these birds gathered on the banks of a large dam one evening, and appeared to be settling in to spend the night lounging on on the edge of the golf course. Judging by the amount of moulted feathers and droppings lying around, this is a regular occurrence. There is a whole range of feathers here. The long pointed central one is an outer primary; two 2 below it are inner secondaries. The rusty feather is a tertial. 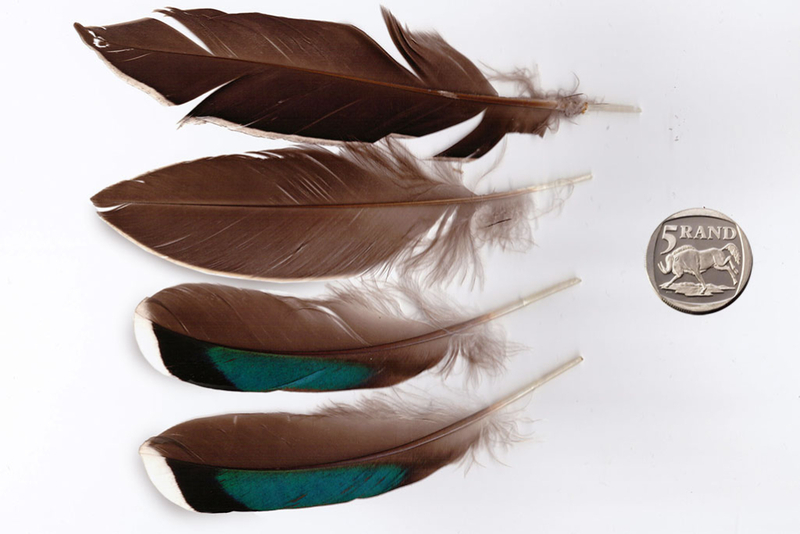 The one next to it, with the brown tip, is a breast feather. The 2 barred ones are flank feathers. Finally, the white-tipped one I am not sure about – it might be a greater wing covert of an immature bird. These large, noisy and aggressive birds are often considered a pest in urban environments (such as golf courses). They have also been introduced to other parts of the world, but are indigenous to Africa, as far north as the Nile River valley. Because of the number of moulting birds present, I could construct virtually an entire goose out of all the feathers lying around. The rusty red colour of the tertial feather is a good clue. In fact, the scientific name of this species, Alopochen, means “fox goose” probably in reference to the foxy colour. The finely barred flank feathers are also informative – much more finely barred than e.g. White-faced Duck. 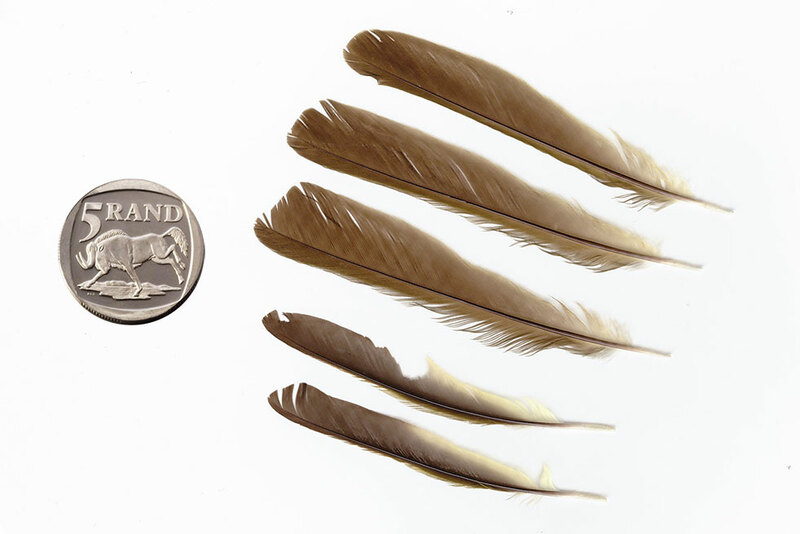 The brown-tipped breast feather is the one of the series that forms the brown chest spot of this species. I was walking along the shoreline of the dam, and when I came around a corner I surprised this massive bird that took off with heavy wingbeats and made its way slowly across the dam. I was elated to find it had left me this souvenir: an outer primary the length of my forearm, and with a shaft as thick as my little finger. There is not much to go on here, except that this is obviously one gigantic feather. You’ll also note that it strongly emarginated (the narrowing of the outer web towards the tip). Also, the exposed part of the feather shaft (rachis) is dark, and not white as in many species. 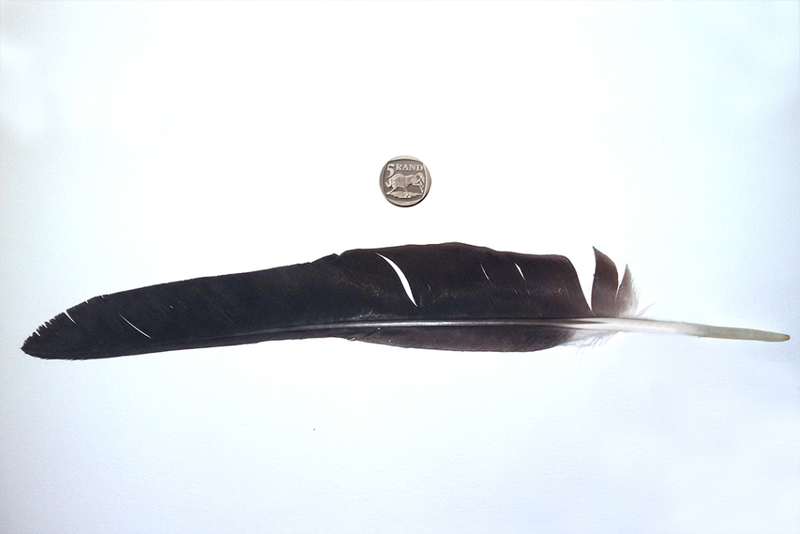 The feather is very dark, but has a faint blue-grey tinge. As is to be expected from this 1.5 m high, 4.3 kg heron (the world’s largest), the primary feathers are really impressive structures, and if you wave them up and down they actually generate quite a bit of lift/resistance. Something like a Spur-winged Goose would also have been a good guess, but in that species the feather shaft is mostly pale. A vulture has similar size and shape remiges, but the description of the habitat should have ruled that out as an option. This rarely seen but vociferous forest bird somehow found its way into our chalet on the edge of the forest. The farmhouse cat had popped in for an ear-scratch (and maybe a lick of milk? ), and as luck would have it, there was this dazed and confused passerine just flapping about against the sliding door. Predictably the cat instantly pounced on the unfortunate and disoriented bird. After we wrestled its potential prey from its jaws, the cat slunk away with typical feline nonchalance, and we released the bird again. Despite missing a few feathers, it flew without any apparent problems. 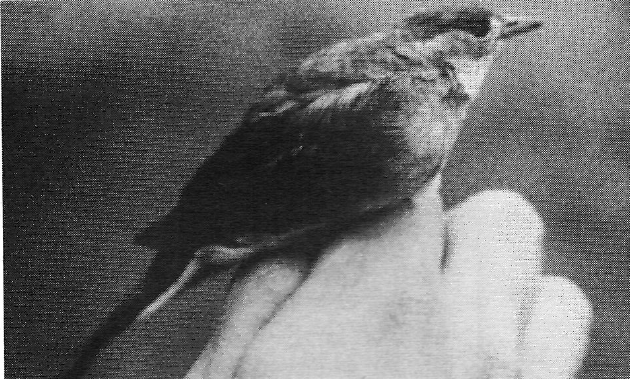 This is the only passerine featured in the quiz. A rather nondescript bird, which lacks any distinctive patterns or markings. However, the greenish tinge of the feathers is characteristic. In fact, this species and a few of its relatives, is named after the green colour. A challenge! 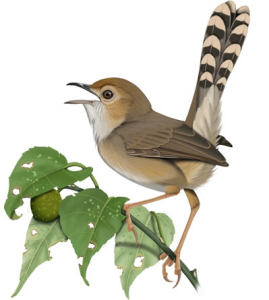 As mentioned in the clue, the greenish colour is characteristic – if you think about it, and keep in mind that almost all birds live in association with green plants, surprisingly few birds are actually green. Which greenbul it is, and whether you can tell that just from the feathers is debatable, but statistically the abundant Sombre Greenbul is the most likely option anyways. The 3 bigger feathers are rectrices (tail feathers), and the other 2 are primaries. The yellow on the inner webs of the flight feathers is subtle – this is much more pronounced on e.g. Yellow-bellied Greenbul. A tricky one! 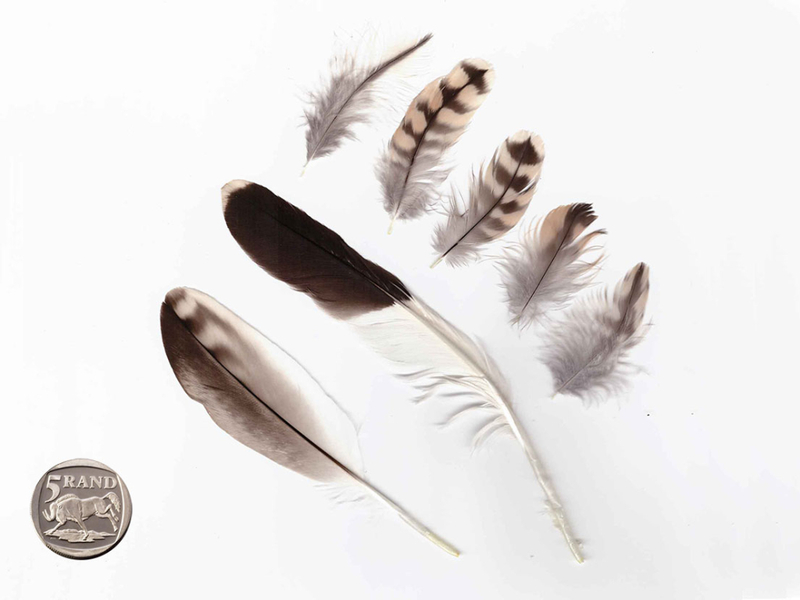 These feathers are from a growing juvenile (many were growing simultaneously, and most still had indications of their sheaths at the base). The bird had apparently been caught by some predator and most of the meat had been eaten, but a few feathers were still fluttering around. The predator was probably something terrestrial like a Water Mongoose, or perhaps a Serval. The 3 large feathers are primaries. The two banded feathers are underwing coverts, while the one at the top with the broad brown fringe and blackish central part is a scapular. The primaries are quite short and rounded – this species is evidently not a strong flyer. However, they do manage to traverse quite large distances in search of suitable habitat across tropical Africa. 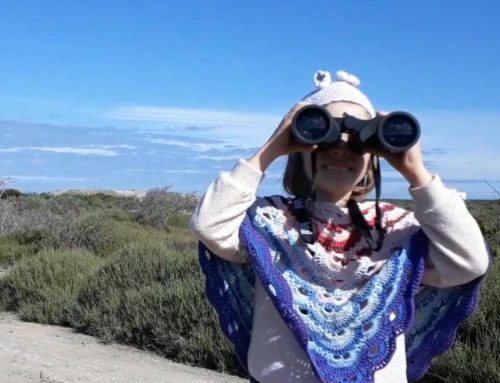 As mentioned in the clue, the short and rather rounded primaries show that this bird is not a strong flyer – normally only fluttering a few feet before dropping into the tall grass again. The combination of black and white barring, plus the blackish dorsal feathers with rusty edges indicate this species. Baillon’s Crake or African Rail are also good guesses. 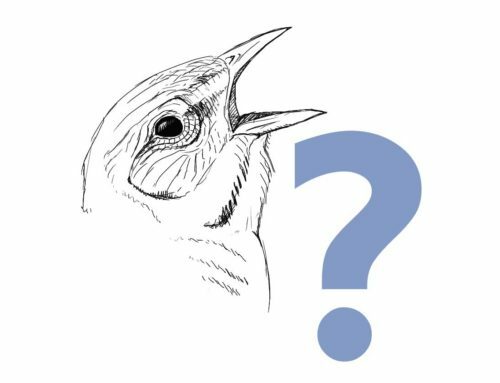 The last question is the most difficult – particularly as this was a captive bird, which does not give us any clue to its habitat or distribution. Just to even the playing field a little, I will say that is a bird of prey. It died in captivity and was donated to the museum where I worked as a curator/taxidermist. These are two underwing coverts that became detached while I was skinning this bird. The rest of the specimen is now preserved as a study skin. There are two major raptor families: Accipitridae and Falconidae. This is a species in the latter group. The ground colour of the feathers should eliminate a few options but the list of possibilities is still large. 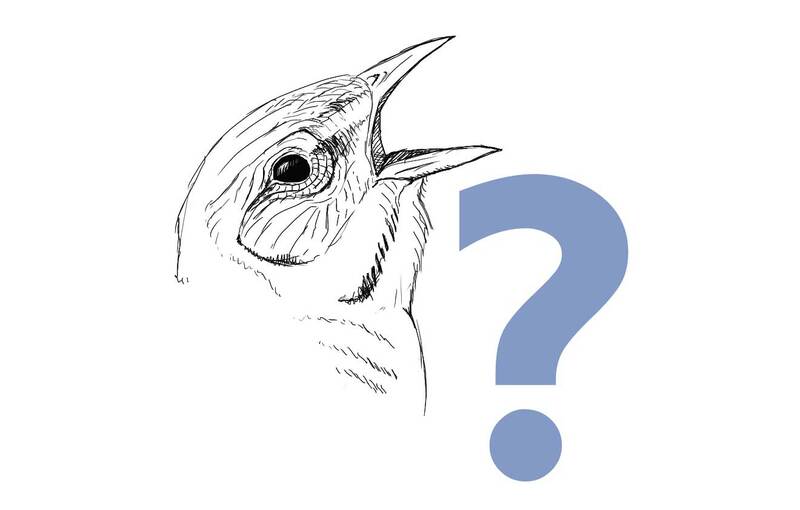 One further clue: it is an adult male bird. I doubt whether anyone would be able to identify this species based only on two little underwing coverts. However, the tiger-like barring and tawny colouration suggests Taita Falcon, African Hobby, female Red-footed Falcon or perhaps one of the kestrels. I tried to help whittle down the list by saying it’s an adult and a male, which would exclude Red-footed Falcon. Kestrel may show some barring, but usually have off-white underwing coverts. How you would distinguish between Taita and African Hobby I don’t know – this level of detail is not shown in field guides.